Located at an antic and unique villa, in the foot of Monte de Sancha and only 50 metres from the beach Playa de la Malagueta. Charming house with lot&s of character. Small hotel with few rooms. Felt really peaceful and safe. Very nice and helpful staff. Excellent breakfast. Nice roof-terrace with fantastic seaview. Close to the beach, supermarket and restaurants. Bus stop just outside the hotel. Took 10 minutes to city centre in Malaga. Really priceworthy hotel. We stayed in several different hotels on trip through Spain as properly as the employees here was the most warm and friendly and helpful of all of them! Extremely recommend! We stayed in numerous different hotels on trip through Spain along with the employees here was the most friendly and helpful of all of them! Highly recommend! Pleasant, clean, safe and friendly hotel. Courteous staff. Completely no problem in recommanding this hotel. 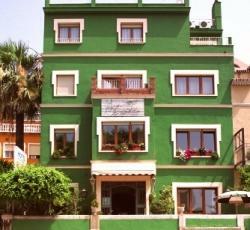 Characteristic and nice hotel with a great location near beach and quite near the center of Malaga; warm and friendly staff; big, cozy and clean room with private bath (but, sometimes, towels weren&'t properly cleaned, maybe due to a not always good laundry washing service) and air conditioning. There are some restaurants, stores and pubs nearby. Characteristic and nice hotel with a good location near beach and quite near the center of Malaga; friendly staff; big, comfortable and clean room with private bath (but, sometimes, towels weren't well cleaned, maybe due to a not always good laundry service) and air conditioning. There are some restaurants, shops and pubs nearby. * Hotel California rated 4.67 out of 5 based on 9 customer reviews. Hostel reviews with a star rating are sourced from HostelBookers. If you find Hotel California with the same booking conditions at a lower rate somewhere else on the internet after you have booked, we will refund you the total difference.